Help the East Empire Company take care of some pirates. (Optional) Talk to the guard outside the East Empire Company Warehouse. Steal the logbook from Suvaris Atheron. Talk to Stig Salt-Plank in Dawnstar. Depart for Japhet's Folly with Adelaisa Vendicci. Kill Haldyn and report back to Adelaisa. The East Empire Company is a huge organization that originated in Vvardenfell and later set up operations in Skyrim: a warehouse in Solitude and an official office in Windhelm. 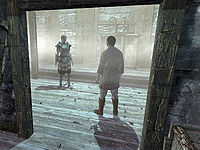 The warehouse near Solitude is off limits, but talking to the guard outside will provide some information on the problems the Company is experiencing. 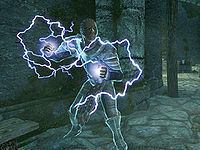 The guard will then point you towards the Windhelm office, specifically an Imperial named Orthus Endario who works there. Travel to the Windhelm dockside office; it will be unlocked between 4am and 8pm, so enter the office and take a look around. The place is falling apart, the shelves are empty, and cobwebs cover most of the ceilings. Orthus will be inside, either trying to clean the place up or eating, and will immediately apologize for the horrible state of the place. When asked, he will explain that pirate attacks have managed to stop all shipments to the Company, from Hammerfell to Vvardenfell, and that the Shatter-Shield clan are the only ones who receive shipments. Apparently, the Shatter-Shields run a private shipping operation, and would be more than pleased with a monopoly on shipments from foreign countries. Orthus has no proof against the clan, but will point you towards a Dark Elf named Suvaris Atheron who works in the Shatter-Shield Office next door. He then hints at Suvaris' logbook, which could contain evidence that the clan is acquainted with the pirates. The quest will now start and you will have to break into the office and steal the logbook. Breaking into the Shatter-Shield Office is not overly difficult. At 8pm, Suvaris Atheron leaves the office to go drink and sleep at New Gnisis Cornerclub until 8am. You can then pick the lock and enter unnoticed. If you're not comfortable with picking Expert locks, you can pickpocket the key from Suvaris. Another strategy is to simply enter the office during the day, while Suvaris is there and the door is unlocked. She is not exactly unwelcoming to visitors, nor does she make much of an effort at guarding her logbook, so wait until she sits down at the table near the front door, then claim the logbook from the table in the northwestern alcove. Leave the office and return to Orthus. When you hand over the logbook, Orthus will read through it and discover that Suvaris often traveled to Dawnstar to meet up with a bunch of pirates, led by captain Stig Salt-Plank. He will also explain more on the pirates and reveal them as the Blood Horkers, a clever bunch not to be trifled with. 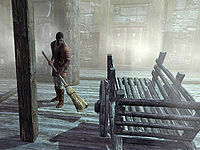 He suspects the pirates can be found at the local inn, so travel to Dawnstar and enter the Windpeak Inn. Locate Stig Salt-Plank and ask him if he knows about the Blood Horkers. He will laugh in your face and admit he'd been captaining them for nine years, then proceed to ask why you are so interested. Pretend to be interested in the ship plundering business and Stig will tell you about someone named Haldyn, referring to him as their 'secret ingredient', as he is a powerful battlemage and functions as the leader of the Blood Horkers. Keep pretending to be interested in joining the Horkers and Stig will get suspicious; you can choose to bribe him or challenge him to a brawl. Both options will lead to him telling you about the hiding place of Haldyn, a place called Japhet's Folly. Alternatively, you can pickpocket Stig's note that mentions both Haldyn and Japhet's Folly, or kill him and take it off his corpse. Attacking or killing Stig will not result in a bounty, or even retaliation by his crew; the player may kill all the pirates with no penalty. "Sorry isn't good enough, Orthus." If you talk to Orthus, he will briefly introduce Adelaisa and point you towards her; when you approach, she will be grateful to finally see someone who can get things done and order you to join her on her mission to stop the Blood Horkers once and for all. When you reveal the name Haldyn to her, she realizes the danger of the mission and will immediately exit the office. Head outside to the docked ship and talk to the East Empire mercenary and agree to tag along on the journey to Japhet's Folly, an isolated island on the very northern border of Skyrim. During the trip, a strange fog forces the ship to drop anchor outside the island, and Adelaisa suspects Haldyn to be responsible for the sudden change in weather. With all her mercenaries too scared of Haldyn to react, Adelaisa will ask you to take out the battlemage, thus making the fog disappear. This should clear the way for the ship and an attack can be launched. You will have no choice but to accept, so jump off the railing and use the many blocks of ice as a path to Japhet's Folly. Follow the map marker to the hidden sea cave and enter. There is no use trying to shortcut by storming the main gate of the pirates' camp alone, as the door to the stone fortress requires a key found inside the fortress. Once outside, you will find yourself in the middle of a regular battlefield as Haldyn's death obviously removed the bad weather surrounding the island. 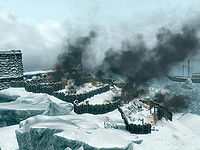 As a result, the East Empire Company mercenaries tear the area to pieces with bombs. The many explosions will not hurt you, but you will have to dispose of all the Blood Horkers that attack you as you make your way towards Adaleisa, who will be waiting on the docks at the bottom of the mountain. When all is said and done, talk to her and she will congratulate you on a job well done and tell you to say the word when you want to return to the mainland. Back in the East Empire Company, Orthus Endario will be overwhelmed with joy and hand you a leveled amount of gold for your trouble. He even suspects the bossy Adelaisa will go easier on him from now on and tells you to return to the office if you ever need help; this means that you can ask Adelaisa to be your follower should you ever need her assistance. Additionally, after a few days, the office will be restored to its former glory and you can take almost all the items there for free. After the quest, guards will start to say: "I hear the East Empire Company has reopened, thanks in no small part to you. Well done. 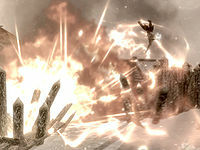 All of Skyrim benefits from their trade." It is recommended that you leave any non-essential followers behind before leaving on the boat. While the fireballs at the end may not have much effect on you, your friends will most likely be flung away with the explosions. After the quest, a random encounter might occur in which you will be attacked by a group of two Blood Horkers, presumably to avenge their defeat. If you have yet to complete Diplomatic Immunity and complete this quest, Orthus can now be found among the prominent guests at the Thalmor Embassy. Under no circumstances should you fast travel back to Japhet's Folly after completing the quest. Japhet's Folly is its own "world" in the game and once you are there you cannot fast travel or leave in any way. If you happened to fast travel to Japhet's Folly and cannot escape by the normal means, you can use the player.moveto console command to place yourself on the normal Skyrim realm. Example: player.moveto 00019DDF plops you right outside Riften, consequence free. If you happen to be at the stage of With Friends Like These... where you have received the Mysterious Note, sleeping in Japhet's Folly will trigger the next stage of that quest as normal. That is, Astrid can still whisk you away to the Abandoned Shack even from Japhet's Folly, thus allowing you to escape even if you are playing on 360/PS3. If you reenter the towers from the Sea Cave entrance after the fireball attacks have caved in part of the walls, you will be stuck there, as there's no door back to the Sea Cave, and the only other exit is blocked by rubble. ? You can get out either by using the player.moveto command above, or by using tcl to turn off clipping so you can walk through the rubble to get to the door. During the escape stage after you kill Haldyn, some of the pirates may fall into the water near Adelaisa and get stuck under the bridge, making the quest uncompletable as you cannot talk to her. It is possible, though difficult, to kill them underwater with Ice Storm or arrows. Using Detect Life or Aura Whisper can help you target them. If a pirate continues to hide underwater, it is also possible to swim up to the pirate, open up the Console with the tilde key (~), click on the pirate, and then type in the console command kill. Note that you'll have to close the console and reopen it for the pirate to actually die. If you swim to a little boat south of the island before killing Haldyn, the fireball attacks start prematurely. If you leave that boat, the fireball attacks stop again. Adelaisa can get stuck in 'wounded' position. Reentering and exiting Japhet's Folly may fix this. During your attack on the keep, before you kill Haldyn, Orthus may appear in front of the door that becomes your exit. He is unkillable, however, he gets stuck there and does not appear back on the mainland, making the quest unfinishable. ? 10 The East Empire Company is being harassed by a group of pirates and would like me to help shut them down. If I do, the Windhelm office can re-open, and there should be some money in it for me. 100 Finishes quest I've helped Orthus Endario to re-open the Windhelm Office of the East Empire Company by eliminating the Blood Horker base at Japhet's Folly. On the PC, it is possible to use the console to advance through the quest by entering setstage MS10 stage, where stage is the number of the stage you wish to complete. It is not possible to un-complete (i.e. go back) quest stages, but it is possible to clear all stages of the quest using resetquest MS10.